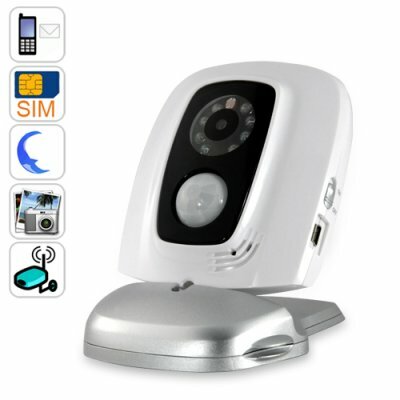 Successfully Added GSM Remote Security Camera with Nightvision - Dual Band to your Shopping Cart. Brilliant security surveillance straight to your cellphone! Call and listen in to conversations, send a command text message and receive an MMS image to your cell phone, pre-se an email address or get a call back and listen in to conversations. With maximum versatility in its use, you are assured of complete peace of mind by getting the security you deserve. This GSM remote camera is suitable to use in your home by the family, in the office with the management staff, or at the factory for supervisors. Essentially, you can monitor your home or office while you're away and protect your family and belongings at all times, just insert a dual band SIM card and off you go. To configure this smart GSM remote CCTV camera, consult the detailed user manual and you'll be ready to start using your brand new DV12 night vision GSM security camera in no time. This GSM remote camera is a remote image capturing device with a motion detection sensor, microphone and infrared lights. It allows you to capture images remotely and send them to your multimedia messaging (MMS) enabled mobile phone, or a pre-set e-mail address. With its practical functions, fashionable appearance and a bright design, this is the perfect security option for your security needs. Click "Add to Cart" now and we'll ship you a sample to see how amazing this intelligent security GSM camera really is. The CVPU-DV12 is brought to you by the number one wholesaler in security equipment and surveillance devices, Chinavasion. NOTES: (1) This product is compatible with GSM at the two frequencies of 900MHz, 1800MHz. It will not work in the United States, Canada, Mexico. Send images to E-Mail - the DV12 can send MMS images to a pre-set E-mail address. Remote control - control & configure the camera with SMS command from your mobile phone. Built-in lithium rechargeable battery - ensuring continuous operation in case of external power failure. Can I use this camera as a webcam as well? Is it difficult to configure this GSM security camera? Because most Chinese user manuals are not very informative. IS this CCTV GSM remoter security camera provided with a SIM card? This GSM security camera is not provided with a SIM card, you will need to purchase a Dual Band SIM card at your local SIM card provider store.